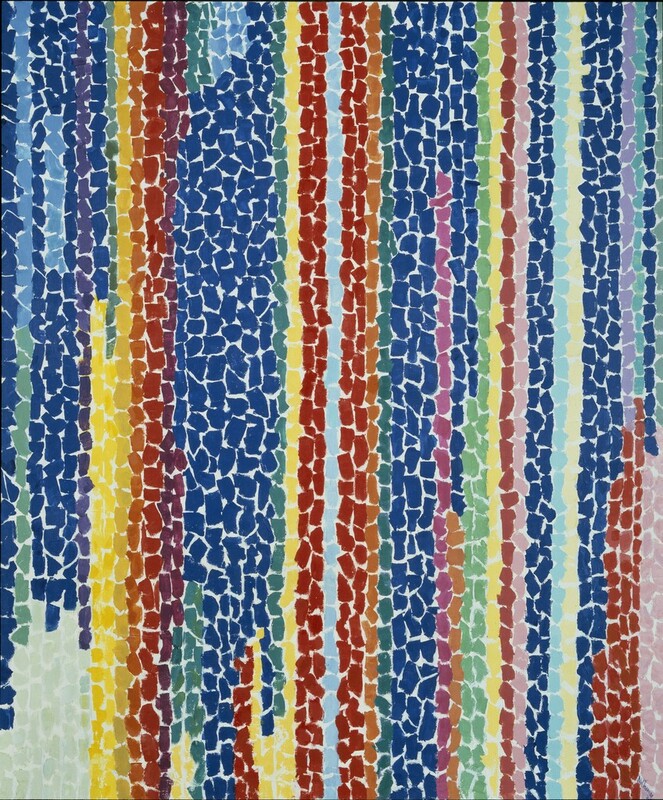 At the age of 69, Alma Thomas retired after teaching junior high for almost 40 years and figured it was time for her to become a world-renowned abstract painter. Despite that kind comparison, Thomas, who was developing her style well into her 70s, was reportedly most influenced by Kandinsky and Matisse. She was also inspired by her direct experience with nature and was known to have studied the hues, patterns, and movement of the trees and flowers in her yard. I know what you’re thinking: but what about outer space? YES, you’re absolutely right, spot on. Thomas was fascinated by the U.S. space program’s lunar missions, which were developing in time with her own artistic career. She claimed space travel heavily inspired her work and gave way to new paradigms and interpretations for space in her paintings. I say, sure, why not. I could see it. If we’re getting really out there, some artists have even referred to Thomas’s work as a kind of “visual music,” similar to “minimalist jazz piano.” As crazy as that may sound, it’s a heck of a lot cooler than hearing “vertical sequences of patches in deep blue, yellow, red and orange, [creating] a syncopating rhythm.” I’d rather listen to jazz, thank you very much. As an African-American artist, Thomas’s decision to be an abstract painter during the Civil Rights Movement was, in a distanced way, a political statement all its own. When asked if she thought of herself as a black artist, she said “no, I do not. I am an American.” As a patriot, it is fitting that one of Thomas’s paintings hung in the Obamas’ dining room! Perhaps a more accurate label for Thomas (if we must label) might be “Modern Afrofuturist Metaphorical Explorer of Deep Mental Space,” all things which Thomas considered herself to be. She believed in focusing on beauty rather than “man’s inhumanity to man,” and her resilient optimism shines through in works like Iris, Tulips, Jonquils, and Crocuses. National Museum of Women in the Arts Editors. “Iris, Tulips, Jonquils, and Crocuses.” www.nmwa.org. Accessed November 26, 2017. https://nmwa.org/works/iris-tulips-jonquils-and-crocuses.